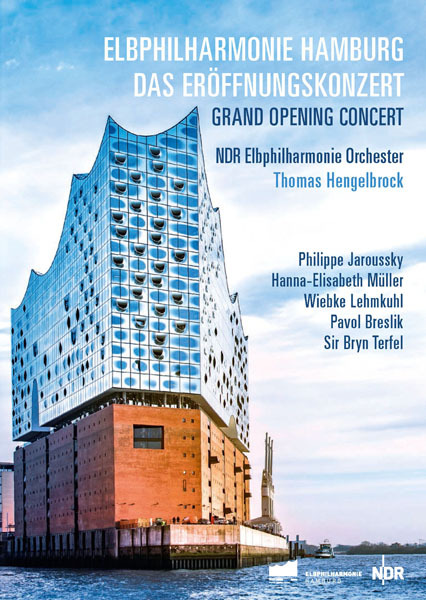 This past January, the eagerly anticipated new hall for the NDR Elbphilharmonie Orchestra had its debut concert in Hamburg, Germany. The Grand Opening Concert is presented in its entirety on a Unitel DVD. The box set includes a bonus DVD, which shows the history of the construction of the hall and the surrounding complex. The concert hall is located inside a glass structure built on top of a former warehouse that overlooks the harbor. The challenges of construction were immense, leading to years of delay and cost overruns. The building had to be insulated from foghorns and other sounds from the city and passing ships. The ground had to be reinforced to bear the weight of the structure. It had to be tested to make sure it would not be affected by adverse weather. Yasuhisa Toyota, a leading acoustician, was brought in to work on the sound quality within the hall. The documentary includes sound bites from those involved in the project (from architects to politicians) as well as critics. The completed project contains a public area that is free and offers views of the city skyline and the river. Visitors reach the top by riding on the longest curved escalator in the world. The Grand Hall, where the debut concert took place, seats 2,100. The complex also contains a more intimate recital hall as well as a Westin hotel and apartments, a spa, a two-story restaurant, a car park and six studios where educational programs will be held for children and adults. The resident orchestra, the NDR Elbphilharmonie Orchestra, performed at the opening under the baton of Thomas Hengelbrock. The program covered music from the Renaissance to the present. The Orchestra and chorus are placed in the middle of the hall with the audience surrounding them. The first piece was a solo by oboist, Kalev Kuljus, standing on a high balcony, playing Benjamin Britten’s “Pan” from “Six Metamorphoses After Ovid.” While the seductive music is performed, the video shows the musicians, the audience and outside scenes of the light show on the glass as well as views of the harbor. This technique continued throughout the concert. The Britten piece was followed by the bracing sound of “Appels” (“Calls”), the opening movement of “Mystère de l’instant.” (Mystery of the instant), for twenty-four strings, cymbals, and percussion by French composer Henri Dutilleux. The work was supposedly inspired by bird calls. The countertenor Philippe Jaroussky, accompanied by the harpist Margret Köll, sang “Dalle piu alte sfere,” written by Emilio de’ Cavalieri and Antonio Archilei for a 1589 royal wedding in Florence. The text deals with the cosmic order. The concert continued in this way, going back and forth between the peaceful, early music and more turbulent modernist fare. Bernd Alois Zimmermann’s “Photoptosis” (“Incidence of Light“) from 1968 preceded the five-vocalist Ensemble Praetorius singing Jacob Praetorius’s 1606 “Quam Pulchra Es.” Pianist Ya-ou Xie is the soloist on Rolf Liebermann’s 1947 “Furioso.” Jaroussky and Köll returned to deliver a beautiful rendition of the 1601 “Amarilli mia bella,” by Giulio Caccini. The finale from Olivier Messiaen’s 1948 “Turangalîla-Sinfonie” is probably the most engaging of the modern works on the program. The composer described it as a hymn to joy. The concert’s second half started with the Prelude to Wagner’s opera“Parsifal.” Tenor Pavol Breslik was the excellent soloist on a new work, “Reminiszenz,” by Wolfgang Rihm. The concert ended spectacularly with the last movement of Beethoven’s Ninth Symphony with soloists soprano Hanna-Elisabeth Müller, alto Wiebke Lehmkuhl, tenor Breslik and the bass-baritone Sir Bryn Terfel along with the combined NDR and Bavarian radio choirs. The audience was quiet throughout the concert, saving their applause until the end. The video and audio quality of the DVDs are state of the art. Watching the DVD of the concert and the documentary made me want to visit Hamburg.